KERALA is a painters dream with something to inspire everyone from industrial to rural scenes, from busy harbours to tranquil backwaters, from ornate temples to dilapidated colonial palaces, from seascapes to tea plantations and lowland jungles, from spice markets to exotic wildlife, and from serene yoga to classical dance schools. 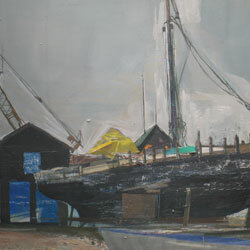 JASON BOWYER is a highly respected contemporary figurative artist and President of the NEAC. He is an enormously inspirational tutor finding abstract solutions to resolve his visual and conceptional ideas and connecting with students of all abilities. 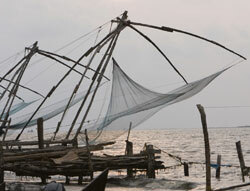 Every day will be spent painting the eclectic mix of subjects that Kerala has to offer. You may choose to work independently or alongside Jason learning by example. Individual guidance will be given when appropriate and everyone will be encouraged to participate in the lunchtime and early evening rendezvous. This free-style painting holiday is most suitable for painters with some experience. We have personally and carefully chosen an itinerary for you that offers the best of Kerala whilst staying in just two contrasting areas. For most of the time you will be staying at the Brunton Boatyard Hotel on the harbour front of Fort Kochi, which provides constantly changing views and is one of the most wonderful hotels in all of India. From here you can wander around Fort Kochi exploring the backstreets and the waterfront areas where you’ll see cantilevered Chinese fishing nets being used, or take local ferries and rickshaws to discover other areas of Cochin. 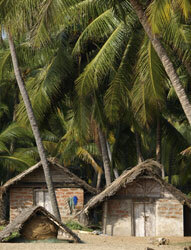 One day will be spent painting from traditional rice boats as you cruise along the languid backwaters. A four-night sojourn to a hill station amongst coffee, cashew nut and spice plantations will provide a different experience and range of painting subjects. You’ll stay at the beautiful Shalimar Spice Garden hotel and spend the days painting in Periyar National Park where we hope to paint elephant and deer from viewing platforms and in the nearby village of Kumily at its Indian classical dance theatre and its local spice markets and Keralan-style temples. Everything is included (except some lunches) and organised for you by an accompanying programme co-ordinator from the UK, making sure that you are as comfortable as possible and that you have a truly wonderful painting holiday. Just 10 – 18 people will be joining Jason Bowyer. The price is £3,795 per person in a twin, fully inclusive (except for some lunches). The supplement for single occupancy of double rooms is £500.